The last couple of days have been very hot by Bay Area standards. As much as I've been wanting to curl up in my new cape scarf or indulge in any of the basic fall shenanigans, 90+ degree days call for shorts, sandals, and the thinnest of tank tops. 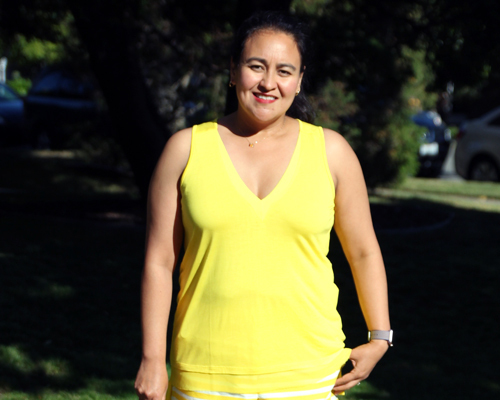 I found this cute yellow top at Nordstrom Rack recently and my husband said, "Wow, that is NOT a mellow yellow. It's a little in your face, no?" Well, yes, it kinda is and I love it. I also noticed that since I took a "break" from running for the last few weeks, I've started to get chunky again so I am more than likely going to start at my local running store again soon.